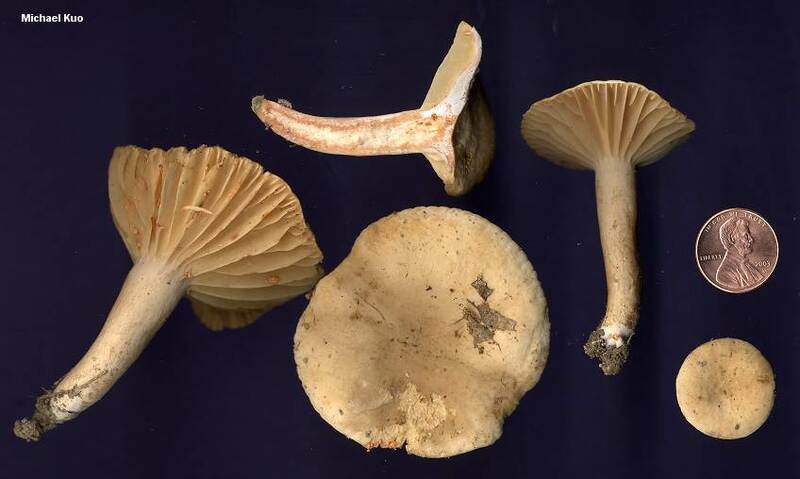 This Lactarius is found east of the Rocky Mountains, and is especially common under oaks in the southeastern United States. 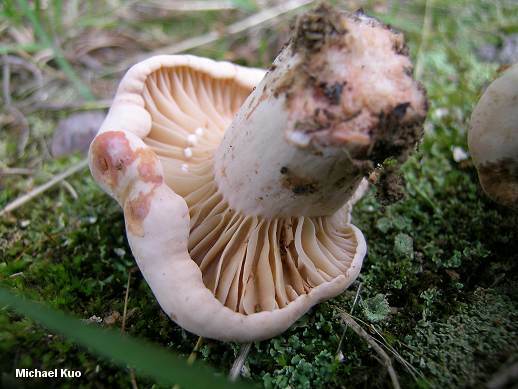 It is easy enough to identify: the cap is usually a pale shade of yellowish brown, and its margin is often scalloped or pleated at maturity; the gills are very distant; and the milk, which is white when exuded, dries pink and stains the gills and flesh pink. Ecology: Mycorrhizal with oaks and, perhaps, with other hardwoods; growing alone, scattered, or gregariously; summer and fall; widely distributed east of the Rocky Mountains, but especially common in the southeastern United States and in Mexico. Cap: 3-10 cm; flat, with a central depression, or shallowly vase-shaped; the margin usually becoming scalloped or pleated by maturity, at least shallowly; smooth or somewhat wrinkled, especially in age; bald or very finely velvety; whitish to yellowish buff, eventually darkening to light brown or grayish brown. 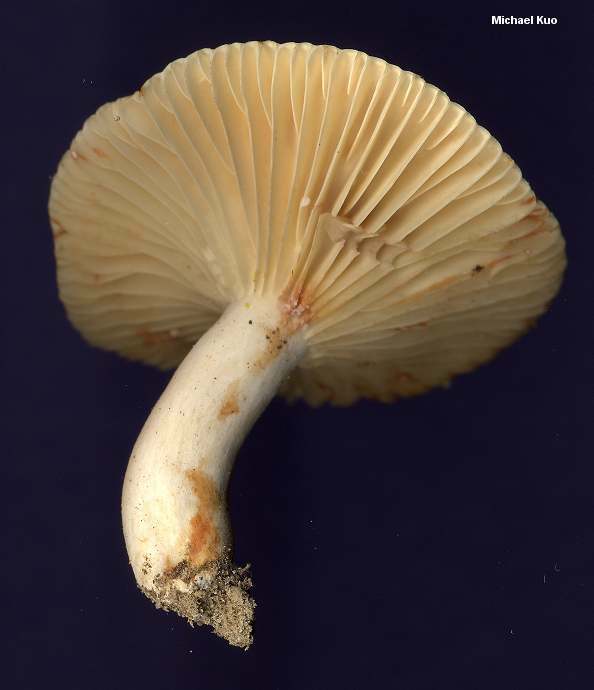 Gills: Beginning to run down the stem; very distant (about 1-3 mm apart at the margin); yellowish; stained salmon pink (sometimes slowly) by the milk. 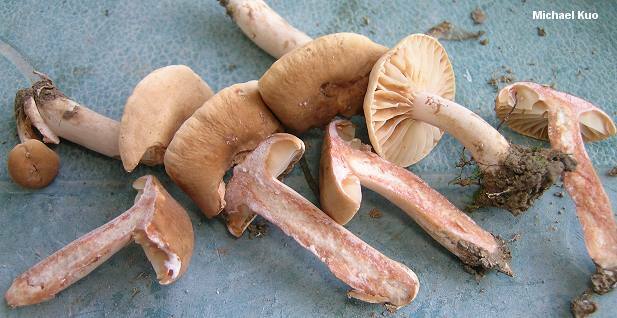 Stem: 3-8 cm long; 0.5-1.5 cm thick; equal or tapered to base; smooth; colored like the cap or paler; dry; hollowing. Flesh: Soft; whitish; staining salmon pink when sliced. Milk: White; drying pink; staining tissue pink. Odor and Taste: Odor not distinctive; taste acrid (or sometimes mild, especially in older specimens). 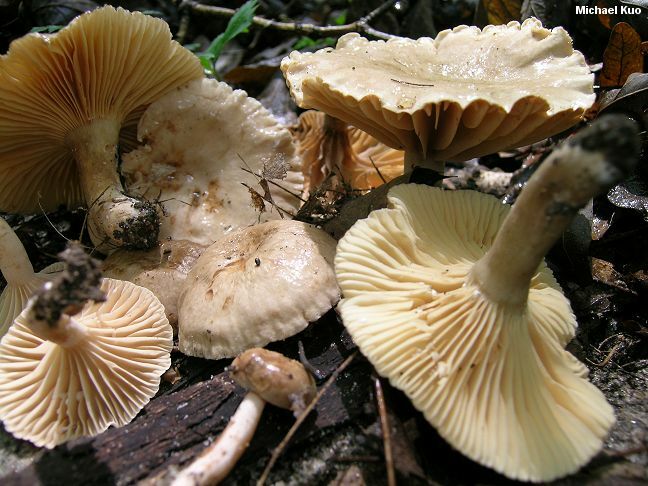 Spore Print: Creamy or buff. 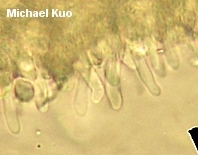 Microscopic Features: Spores 7-9.5 x 7-8 µ; subglobose; ornamentation 1.5-2.5 µ high, as amyloid spines and wide, branched ridges that do not generally form reticula. Pleuromacrocystidia absent. 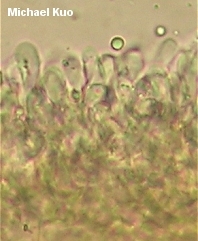 Cheilocystidia subcylindric; to about 35 x 5 µ. Pileipellis a trichoepithelium or trichopalisade, with terminal cells cylindric to subclavate. REFERENCES: Coker, 1918. (Coker, 1918; Hesler & Smith, 1979; Smith, Smith & Weber, 1979; Weber & Smith, 1985; Montoya et al., 1990; Phillips, 1991/2005; Roody, 2003; Binion et al., 2008.) Herb. Kuo 08240204, 06270301, 07280305, 08040304, 07280404, 07070709, 07160804.